When people are asked about their favorite film coming up this year, it’s almost as if you asked them if they wanted a cookie. Their eyes light up, they consider it, and they burst out saying what film they are the most excited about seeing. No one can blame them; there are many movies coming out that people have been waiting for, and soon they’ll finally be able to watch them. Movies like Alita: Battle Angel, Detective Pikachu, Captain Marvel, Infinity War: Endgame, Shazam!, the live-action/animations of Dumbo and Aladdin, Hellboy, and John Wick 3, just to name a few, are coming out by June, with much more later in the year. I asked 50 random McCallum students what movie they were looking forward to watching this year and why, and overall, people most mentioned these films: Infinity War: Endgame, Spider-Man: Far From Home, Toy Story 4, Godzilla, King of Monsters, Sonic The Hedgehog, Detective Pikachu, IT Chapter 2, Joker, Child’s Play and Star Wars IX. Avengers Infinity War: Endgame has gotten a lot of attention, especially at McCallum, being the No. 1 movie people were excited about from the poll. Perhaps this anticipation is due to it being the long-awaited sequel to the original Avengers: Infinity War. The sequel wraps up the questions both its comic lovers and the regular Marvel Cinematic Universe movie fans alike have, and for those who haven’t read the comics or spoiled it for themselves have also shared their theories on what might happen in the upcoming movie. Though in the first movie, the characters within Avengers: Infinity War met a seemingly detrimental fate, their fans don’t think they’ll be gone for long. “It could be that one of them gets a hold of the time stone or if Antman uses his new quantum-realm technology to bring the characters back,,” said one McCallum student that I talked to. “Whatever it is, I believe that the characters that died do somehow come back, like Spider-Man in Spiderman: Far From Home. “Of course, there’s many things that could happen, and I personally don’t think anything I could think of would be accurate enough, but it’s fun to speculate on what might happen,” another McCallum student said. For those who have read the comics, or maybe have spoiled themselves on a bit of the plotline, they cannot wait to see the portrayal how the rest of the movie will turn out, and ready themselves for a cinematic ride this April. With everyone excited for the endgame, McCallum’s students are also interested in Spider-Man: Far From Home. With the return of Spider-Man on his vacation in Europe comes a series of obstacles when Nick Fury shows up in his hotel room. Parker soon finds himself donning the Spider-Man suit yet again to help Fury stop Mysterio from creating chaos throughout the continent. The confirmation of our friendly neighborhood Spider-Man’s return is wonderful and will prove to be a popular pick in the cinemas come this July. Toy Story 4, coming out in June, is the third most-mentioned movie McCallum students mentioned. The first Toy Story came out in 1995, with characters that are older than students at McCallum. Regardless, many of the students concluded the movies in this franchise as endeared childhood memories, and are excited that a new cast will be introduced, including Ducky and Bunny, two characters that are shown in the Toy Story 4 trailer. “I remember growing up watching the Toy Story series; I always liked the Army Men and how they basically came and went as they please and met up with Woody when they could, even after they went in separate ways,” one respondent said. “I can’t wait to see the new cast coming out! Bunny and [Forky the Duck] look so fluffy and funny, and Forky’s gonna be played by Keanu Reeves,” another student said. McCallum students are ready for the year of many movies, where there’s something for everybody. 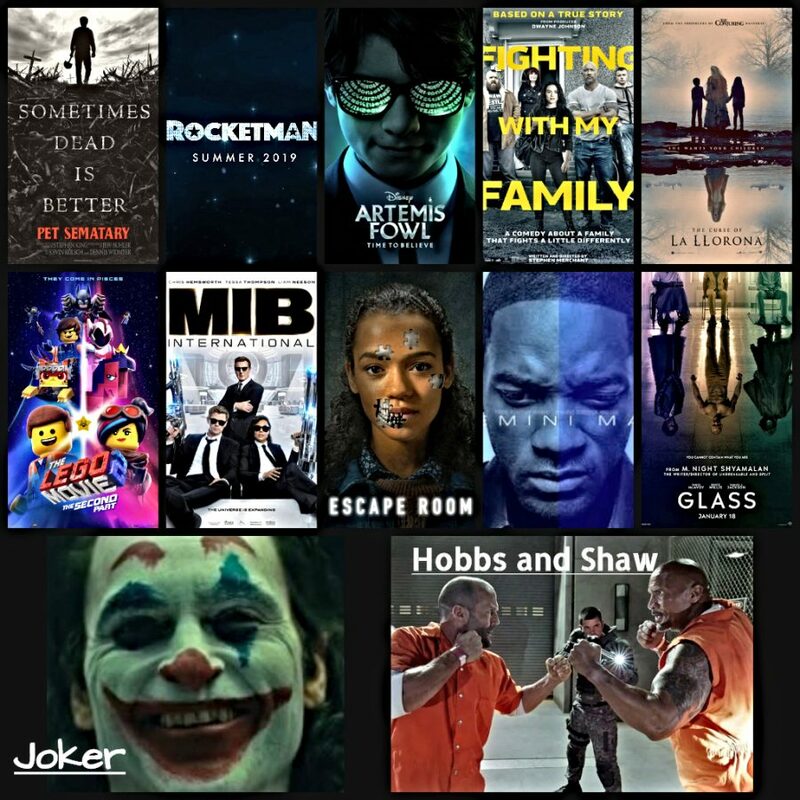 Whether you want an action film such as John Wick 3, a comedy like The Lego Movie 2: the 2nd part, or a movie to bring nostalgia from childhood movies like The Lion King, 2019 is sure to bring us on a wild adventure of exhilarating, heartbreaking, and laugh-filled films that will fill the year. Infinity War: Endgame got the most votes for which movie McCallum students were most looking forward to this year. With the upcoming release of Spider-Man: Far From Home as well, 2019 looks to be a big year for superhero movies. Graphic by Grayson Cruise.